Shooting lines are a key part of shooting head systems, where the main weighted belly of a fly line (i.e. shooting head) is connected to a shooting line that lets the head sail to distance. Shooting lines were used originally by competition fly casters, who replaced the skinny but sticky standard running line on their fly lines with even skinnier and slicker monofilament to get maximum distance. Anglers quickly adopted shooting head systems, which let them swap out shooting heads of varying sink rates, using just a single shooting line, giving great angling versatility without extra spools. Today, these two factors – enhanced distance and fly line versatility – have solidified shooting head systems as standard tackle for anadromous anglers. The shooting line is key to this system because it connects the angler to the shooting head, and most of a fishing day is spent handling the shooting line. There are three main categories of shooting lines (and some variants) to consider when choosing a shooting line. Monofilament shooting lines are the distance champion, and come in both solid and hollow core varieties. Solid cores are less expensive and sink when coils are laid on the water, but they also clear the water easily on the cast. They’re made in round, oval, and flat cross sections, though few anglers notice these differences, and even standard spinning reel mono in 20-30-40 lb can work well. Hollow core monofilament shooting lines are intended to float, and usually do, coming off the water very easily, though are more expensive and weaken easily when kinked. Mono Pros: super slick, great for distance, and standard solid varieties can be very inexpensive. All mono is especially nice with lighter (< 400 grain) trout-weight heads. Tech note: Rio recently introduced their “Gripshooter” monofilament running line, which provides a grippy plastic-coated holding section, making it easier to hold. Braided shooting lines are made of very thin monofilament strands braided together into a rope, similar to the braided core of many fly lines. Because they’re braided like rope, they hold water and can freeze in super cold weather. They also make a characteristic “zing” sound when going through the guides. This category is most familiar to fly anglers, with plastic coated lines that feel like skinny flyline in the hands. Many varieties are available, with coatings optimized for hot, cold, or all-around use, and built on cores ranging from stretchy monofilament to moderate-stretch braided nylon to specialty low-stretch materials. Most shooting head anglers start with these standard coated shooting lines, then try monofilament or braids for more distance. Coated Cons: least shooting distance, especially after heavy use, and often the most expensive. 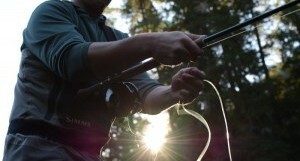 The choice of shooting line affects both the casting performance and tactile feel of a day’s angling. The difference between monofilament, braided, and coated lines is generally more noticeable than choosing different brands of shooting heads, so it is worth some experimentation to find the one you like best. Most shooting lines can also be reversed when worn, or cut back 10’ when they wear at one end, extending their life. Finally, you can cut the running line off an old fly line to use as a coated shooting line, but beware core strength: most trout lines are built on 15 or 20 lb cores, and may not survive a donkey pull if you wrap your shooting head around a tree branch or midstream boulder.